Australia's glorious blue water paradise. Port Stephens is called the “blue water paradise” because of the beauty of its marine surroundings. It is located in New South Wales about two and a half hours north of Sydney, on the East Coast of Australia, and has a population of about 50,000. With over 19 miles of clean, white, sandy beaches, Port Stephens boasts vibrant tourism and fishing industries. 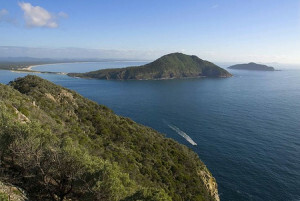 Port Stephens is a naturally beautiful area, with plenty of reasons to visit all year round. In truth, it’s not a town in its own right, but rather a region that is divided into different areas; the Tomaree Peninsula, the Tilligerry Peninsula and the Golden Bight all surrounding the bay. Learn more about Port Stephens. Port Stephens has a great range of accommodation to suit any budget - whether you're a single, couple, or family, you can find ideal accommodation in Port Stephens. Port Stephens is a wonderful collection of seaside villages surrounding a collection of beautiful bay. Discover the wide range of activities to to get the heart racing at Port Stephens, such as sea kayaking, sand boarding and hovercrafting to name a few. Visiting Australia this winter? Why not head south and go snow skiing as well. Book your Australian Ski Accommodation and Accommodation in Perisher at OnSnow now. Port Stephens is the perfect place in Australia to observe dolphins and whales in the wild. Port Stephens is an amazing harbour, surrounded by many unique and interesting towns. There are the larger towns of Nelson Bay and Raymond Terrace, interspersed with smaller bayside villages, such as Shoal Bay, Lemontree Passage, Salamander Bay and Corlette. With the growth of tourism, many of the towns have developed an interesting character and charm. Discover more of Port Stephens Towns. Stockton Beach is a 32km long stretch of beach, in some areas its as much as 1km wide and has sand dunes over 30 meters high. The area is popular with four wheel driving, sand boarding, quad and motorbike riding and swimming. There are many Adventure companies within the area that can provide guided tours for your exploration. See more of Port Stephens Beaches.